Hold up, everybody. Cease fire! 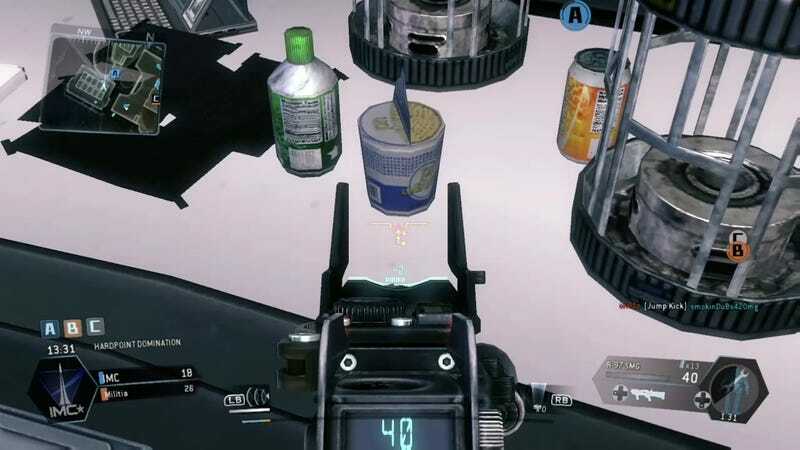 Why are we shooting at each other, when we could be looting Titanfall's levels of booze, snacks, pizza, soda, and the odd Cup Noodles instead? Check out how much food Enjoy the Bits' Paul Yan has found in the game. Yan' mission is to chronicle the appearance of food in video games and other forms of visual entertainment. He's probably why you lost that one Titanfall story mission as well. AS the commander was telling everyone to rally at point C, he was zooming in on fake soda cans and pizza boxes. Over on Enjoy the Bits, Paul has a smorgasbord of food-related Titanfall coverage, from the shop menus to vending machines. While he hunts for more objects from fictional grocery stores, check out some of his finest finds below.